Why Do We Blow One Hundred Shofar Blasts on Rosh Hashanah? 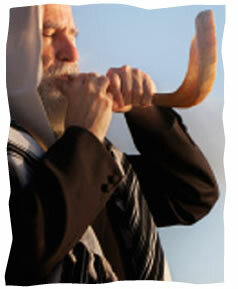 Why do we blow the shofar so many times on Rosh Hashanah? Thus the shofar is blown thirty times during the Musaf Amidah. When the chazzan repeats the Amidah, he repeats these three blessings—about sovereignty, remembrance and shofar—and the shofar is blown after each one, in the same order. To understand the mystical significance of the one hundred blasts, check out One Hundred Sounds. Talmud, Rosh Hashanah 33b and 34a, paraphrased in Shulchan Aruch, Orach Chaim 590:1. Talmud and Shulchan Aruch ibid. Other customs include blowing seventy-one blasts, or 101 blasts. The Chabad custom is to blow the one hundred blasts described above, and an additional thirty blasts after the end of the prayers, for a total of one hundred-thirty blasts. Eliezer Posner is a former member of the Chabad.org Ask the Rabbi team. Why All the Symbolic Rosh Hashanah Foods?